To commemorate the centenary of Pudlo Pudlat’s birth, Dorset Fine Arts is releasing from its archives two never before seen limited edition lithographs, “Formidable Muskox” and “Caribou in Northern Lights”. Printed at the Cape Dorset studios in 1985 and 1987 respectively, these two dynamic prints are superb examples of Pudlo’s work created during the apogee of his career. Pudlo Pudlat was born on February 4th, 1916 at Ilupirlik, a small camp near Amadjuak, about 350 kilometers east of Cape Dorset. 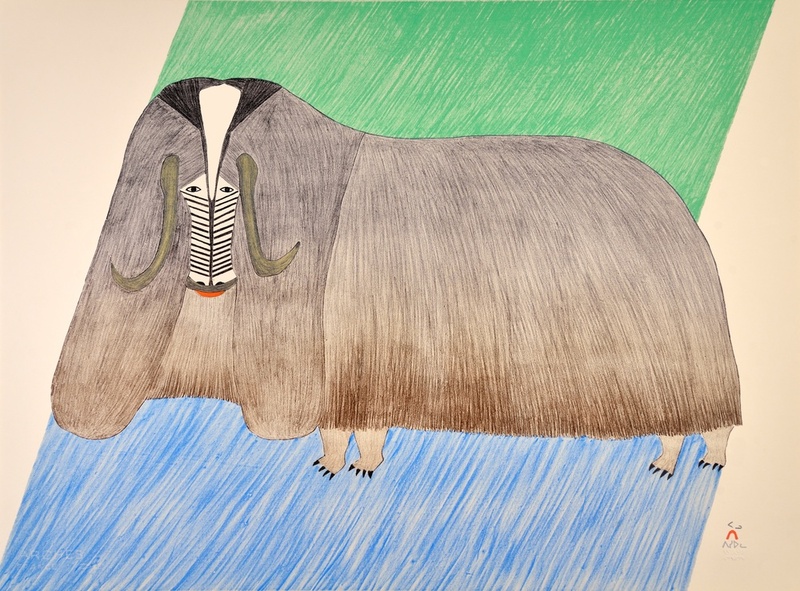 Pudlo was one of Cape Dorset’s most prolific and original artists. He remembered as a child being reprimanded by his parents for drawing on the walls of his family’s snow house so it came as a delightful surprise when as a young man he was encouraged by James Houston and Terry Ryan to peruse his obvious talents as a graphic artist. Pudlo’s early adult drawings and prints often depict strange, beguiling creatures and humorous combinations of fantasy and reality. When acrylic washes were introduced in the studios, Pudlo became an avid devotee to this medium, filling large sheets of paper with wondrous and colourful landscapes. Pudlo is perhaps best known as one of the first artists in Cape Dorset to portray the transition between the traditional Inuit nomadic lifestyle and modern transportation and other technologies. Recognized in his lifetime as an artist who successfully merged these two worlds with humour, optimism and an urban sensitivity, Pudlo was the first Inuit artist to be honoured with a retrospective of his work at the National Gallery of Canada.